Special Process is process which output of the process can not be definite. What is Special Process Validation? Special Process that used as support of manufacturing process that special process need to validation for the ensure the output results positive, all the special processes required validation as per international standard requirements as same validated process is gives a surety to concern product quality as processes are validated. Eddy current testing reference pieces shall be prepared as requirements of the standards materials are in used for testing and its specifications requirements, for examples of process is conduct as standardized instruments with reference standard pieces at least three times and second term being conduct 5 to 06 hours as confirm instrument standardization prior to turning the unit off at the end of the inspection cycle. Instruments shall be calibrated at every year or as per defined by company or as per requirements given in instruments standards, calibration process should be conducted by ISO 17025 certified laboratory only, validation process requirement is concern standardization, in case of wrong measurement reflects equipment’s measurement. ECT Engineers should be qualified for ASNT / ISNT Level I or Level II in Eddy current testing level I / II Inspector for the non destructive inspection. 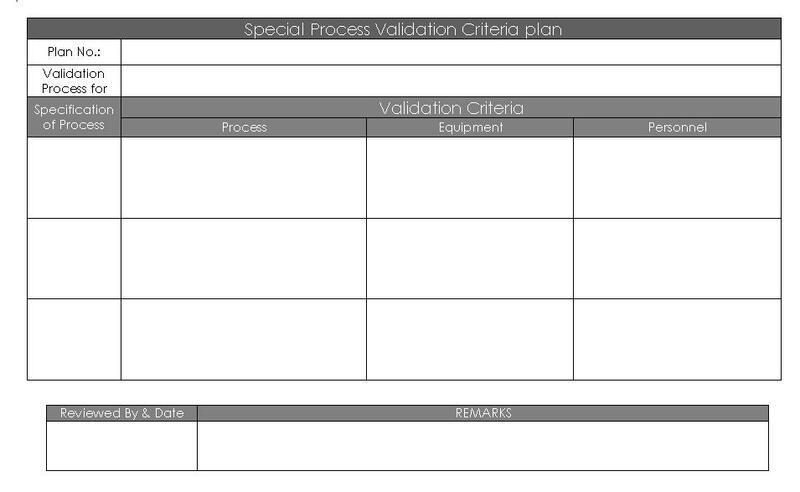 Format of Special Process validation Criteria Plan are available for the download, after download Edit, remove, add, and modify any fields as requirement of your company.